The January chills are in the air, I sand until my fingers are blue and my wanders. Far from here, far from this place to another universe, another future. So I thought I might share with you some of what I have been listening to, as everybody likes a good podcast recommendation on a cold winters eve, and if you have any you would like to share with me please do! 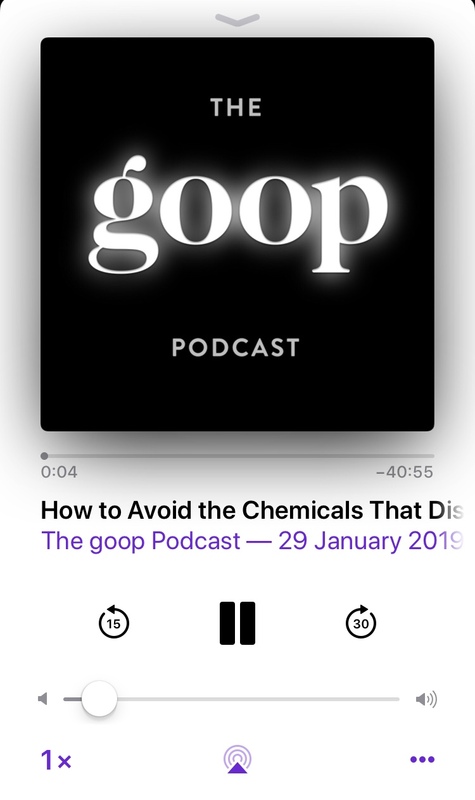 The “GOOP” episode is especially special, as it includes a lot of recent research into Endocrine Disrupting chemicals. Something I have found scarce information on since I first learned about them in 2015. There has been so much research, exposure and communication about the amount of plastic making its way into our oceans, which is truly wonderful! Yet the physical impact of the chemicals present in these plastics (and many other products) on our bodies, namely women’s bodies, is somewhat harder to visualise. Recently, I seem to often be pausing for a moment to reflect upon just how far we have come. To marvel that “single use” has been coined the most popular phrase of 2018. To delight in rarely seeing single use plastic bags, plastic straws or plastic cutlery in every day use. To be so god -damned proud that just three years ago, setting off to research the impact of plastic pollution not just on the planet but on women’s health, I never would have dreamed that in just three short years so many people would be singing the phrases “slow-living”, “low impact” and “zero-waste”. Yet we are still gracing just the tip of the iceberg. These Podcasts, I feel, all dig a little deeper than we currently are at the moment. Within each one glints a golden nugget of wisdom, for this reason I thought I would place them together and hand them out for you to give a whirl.